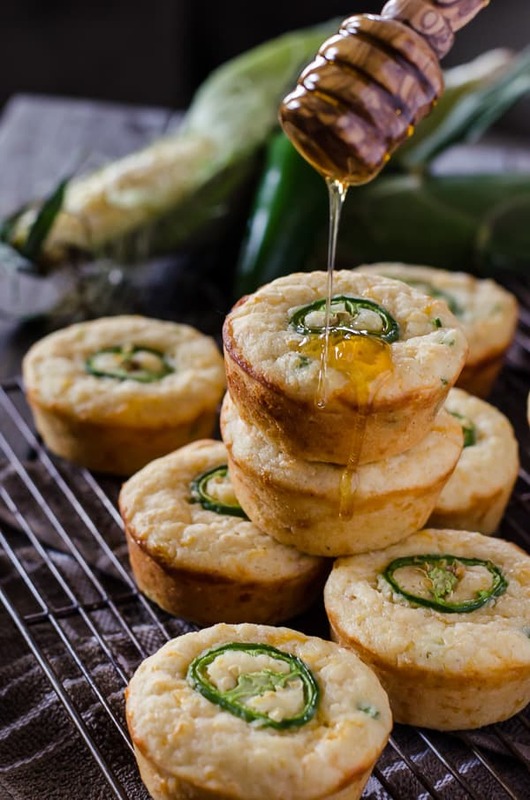 Kick up your cornbread game! 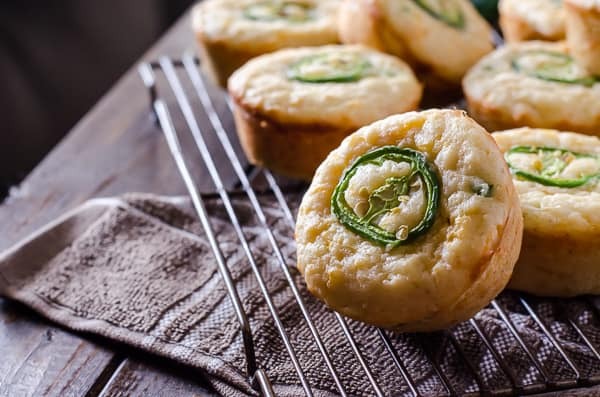 These spicy, cheesy Jalapeno Popper Cornbread Muffins are the perfect side for fried chicken, chili, or just by themselves with a drizzle of honey! Let’s talk about corn, baby. I’d say I’m having a moment with corn, but I’d be lying…since it’s a moment that never ends. Corn on the cob was, is, and forever will be one of my favorite summer vegetables. There is nothing better than smearing melted butter all over your face as you gnaw your way around the cob, not worrying about napkins until you demolish the whole thing. When you’re not eating it straight, it’s also incredibly versatile, and should be a part of all summer meals. Ever. 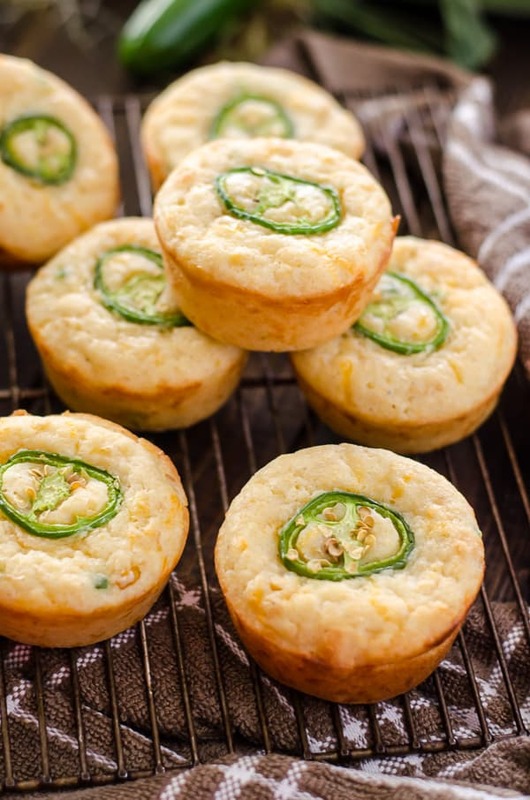 JUST TAKE ME TO THE JALAPENO POPPER CORNBREAD MUFFINS ALREADY! If you’d rather skip my (pretty darn helpful) tips and tricks, essential cooking info, and similar recipe ideas – and get straight to this deliciously easy cornbread muffin recipe, just scroll right on down to the bottom of the page where you can find the printable recipe card! In the past, I have generally avoided cornbread. I can’t say the extra dry, crumbly slabs of ground corn were ever very appealing to me. Give me biscuits with my fried chicken, or give me death. However, this particular recipe, inspired by one I make almost every day at work, makes me want to take the entire muffin tin into a locked room where I don’t have to share the spoils. 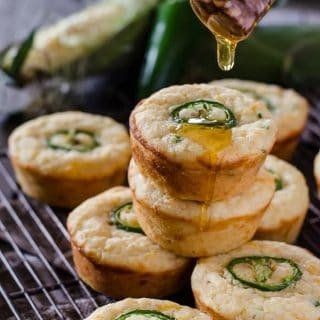 Jalapeño poppers + cornbread + muffins? Yessssssssss, folks. It’s not new or innovative or particularly clever, but it’s a damn good alternative to your usual Southern style cornbread. 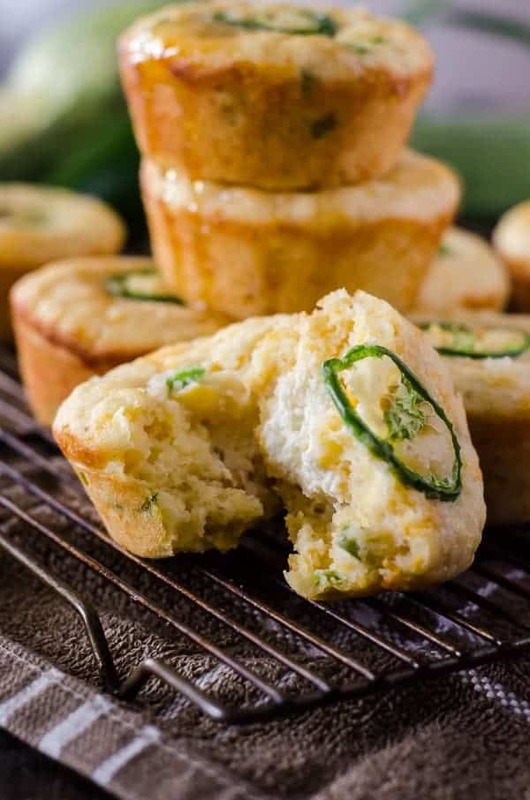 If you’re anything like my hubby and I, and like a little bite of heat in your food, these muffins are SO for you. Between the diced bits inside and the coins on top, there are two big peppers in this batch of twelve. Don’t be intimidated, though – they won’t burn your face off. The secret to cooling these off and making them super moist is sour cream. And then there’s that amazing molten cream cheese center. Not optional. 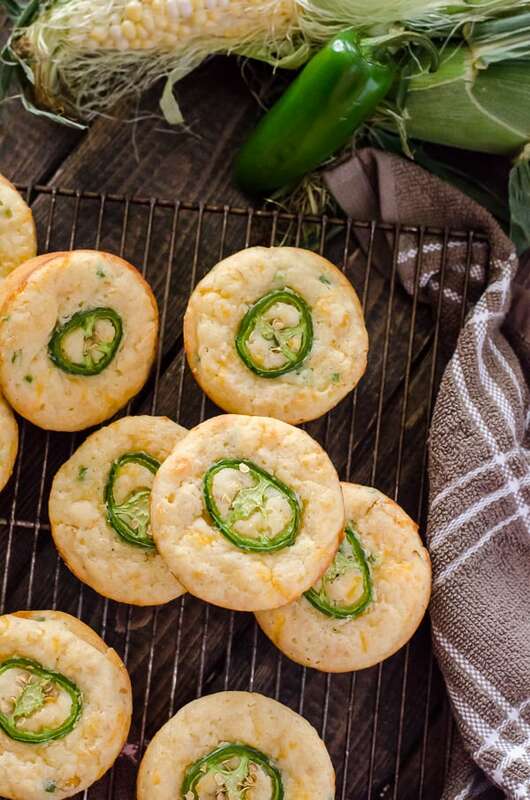 It’s the difference between baking regular jalapeño muffins and popper ones. 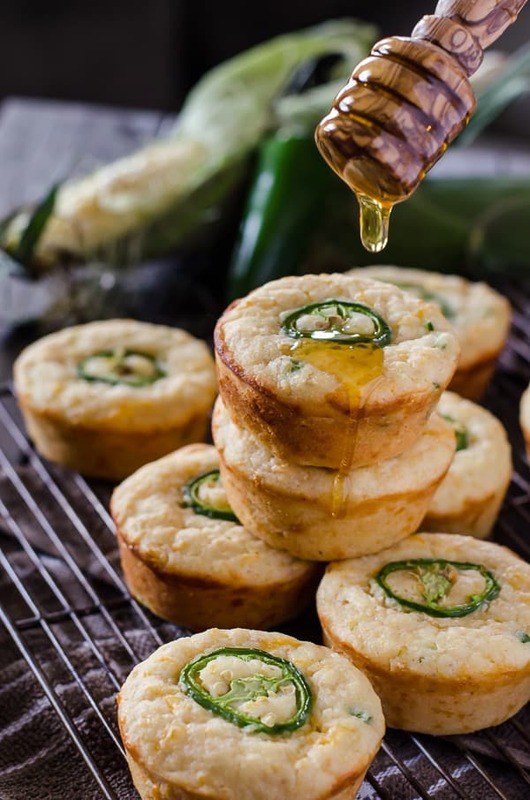 These spicy Jalapeno Cornbread Muffins should absolutely be eaten warm. Bordering on too hot for your tongue. Restrain yourself from diving in as soon as they come out of the oven. That smell is gonna get you. And if I could make one last suggestion? Hit these with a generous drizzle of honey. It will change. your. life. In the best way possible. LOOKING FOR MORE SUMMER SIDE DISH RECIPES? Preheat oven to 400 degrees F. Grease a standard muffin tin and set aside. In a large bowl, combine cornmeal, sugar, and butter. Stir until a thick paste forms. Add eggs and mix until evenly combined. Add flour, baking powder, and salt; stir until thickened and combined. Mix in creamed corn and sour cream, stirring until just combined. 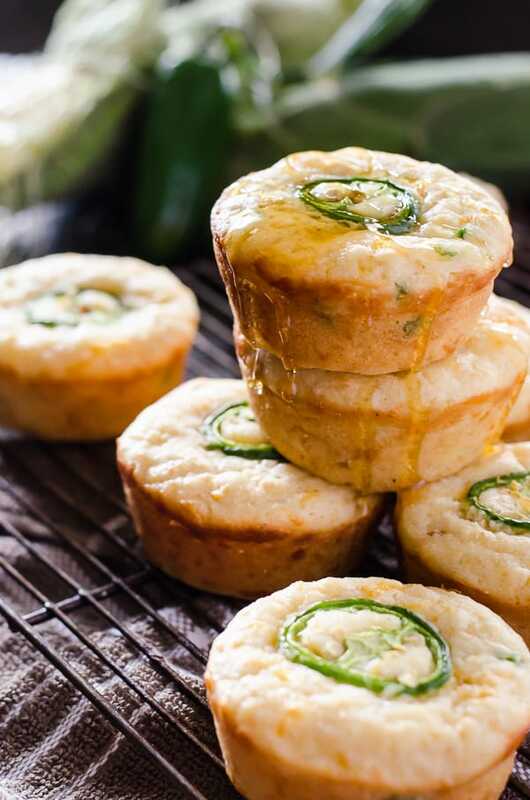 Fold in cheddar and diced jalapeno. Fill each muffin tin ¾ full; add 1 Tablespoon of cream cheese to the center of each, and cover with muffin batter. 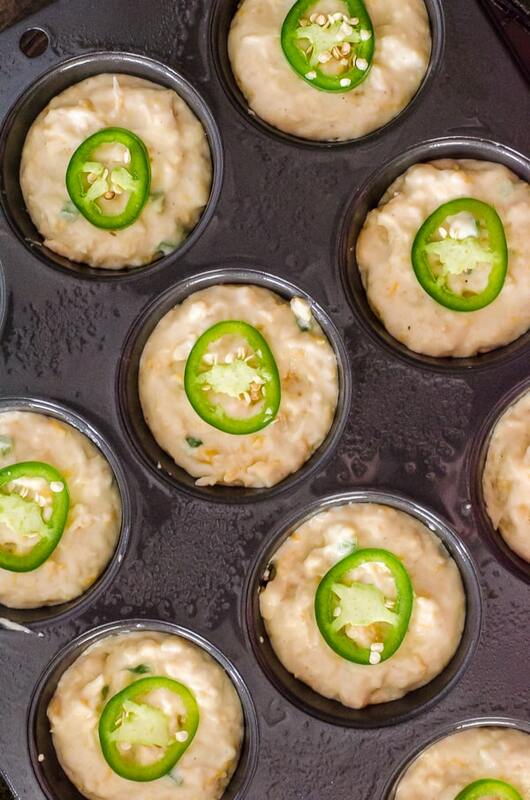 Top each with a whole jalapeno coin. Bake 16-19 minutes, or until a toothpick inserted comes out clean. Serve as a side with a savory dinner, or enjoy with a drizzle of honey. Are you a corn lover? Stock up and get cooking – there’s a recipe in here for everyone! Beside the fact I love the addition of a little heat, these look so pretty. Awesome presentation! Love your photos!!! Time to dig out the cornmeal!!! The photo drew me in and the description of the muffins made me know I would want to eat these on a regular basis. I love a little heat in my food. I can see myself eating these with soup, chili or just because! OMG! These are genius. And they look beyond delicious. The PERFECT side for BBQs that will roll nicely into chili season! Delish! What a fun idea! WE LOVE spicy foods! These look lovely! Love the idea! And amazing photos! Cream cheese sounds like a tasty way to keep these moist! For sure, that cream cheese center! Drool! And that photo with the honey. Yes. I’m not the most experienced cook and these turned out AMAZING!! I’ve been sharing the recipe with everyone I know. They are creamy, full of texture, oh so yummy. I used regular corn instead of creamed corn and they turned out perfect…popped right out of the muffin tin. I also chose not to add honey because the muffins tasted sweet to me without it. This cornbread was the perfect side to the chili we served (http://damndelicious.net/2013/02/01/super-bowl-turkey-chili/). Next time, though, I think I’ll print out any recipes that I want to use from this website. It is very difficult to follow along with the recipe on phone or tablet because of all the popups. The popups are actually making it difficult to comment too 🙁 . Thank you for this gem! I’m going to be making it again for Christmas this year (without the jalapenos) for my picky relatives. I think it will be a winner! Yum! 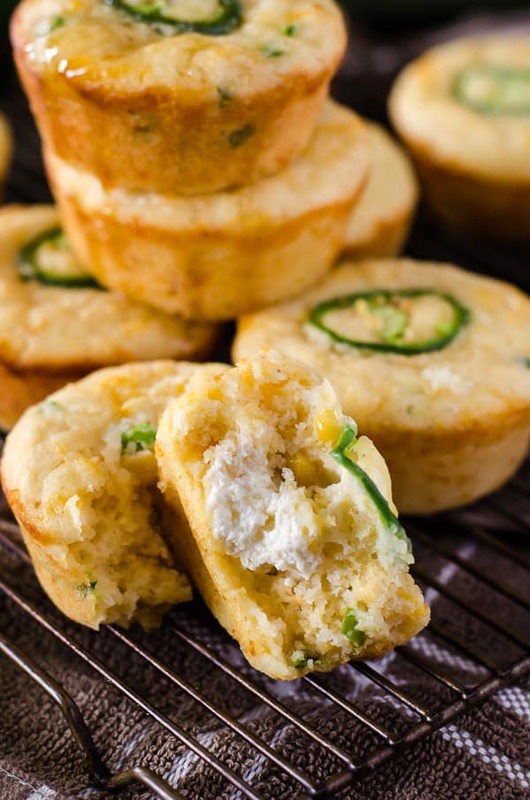 What a fantastic twist on cornbread muffins! 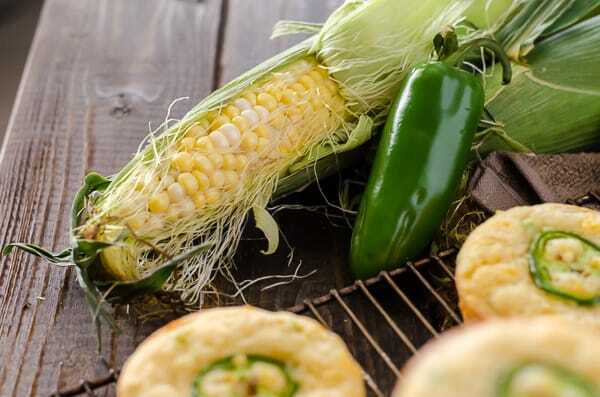 I’ve never thought to add jalapeno to my corn bread before… and I don’t know why not, it sounds incredible! Thanks for a great recipe! can these be made ahead and frozen? If so what do you suggest? They sure can, Elissa! After they cool, wrap them in plastic wrap, then aluminum foil before you freeze them. When you’re ready to reheat, pop them in a 350 oven in some foil until they’re warmed up. Have you tried them with mini muffins? If so, how long would you cook them for? Also, do you think they can be cooked the day before without losing any flavor?